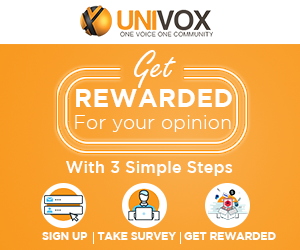 Univox Community lets you earn rewards for sharing your opinion. Join for free and get $2 as a sign-up bonus. Then, earn more points by completing surveys and referring friends. 100 points are equivalent to $1. Redeem your points as Amazon gift cards, PayPal, and virtual Visa or Mastercard.